Bric-a-brac refers to lesser 'objets d'art' which form collections of curios. The term is thought to be of French origin and became popular during the Victorian era. I'm pretty sure my collection of bric-a-brac used as containers in the studio are more curious than curios. I can say, some of them are 'objets d'art' since I made them while teaching a coil clay pottery class. Made as a 'demo' and glazed with an unlabeled bottle of under glaze...imagine my surprise when it came out of the kiln. My students dubbed it 'Brainiac'. Their coil pots also would forever be Brainiacs, too. I wonder how many have survived...the pots...that is. 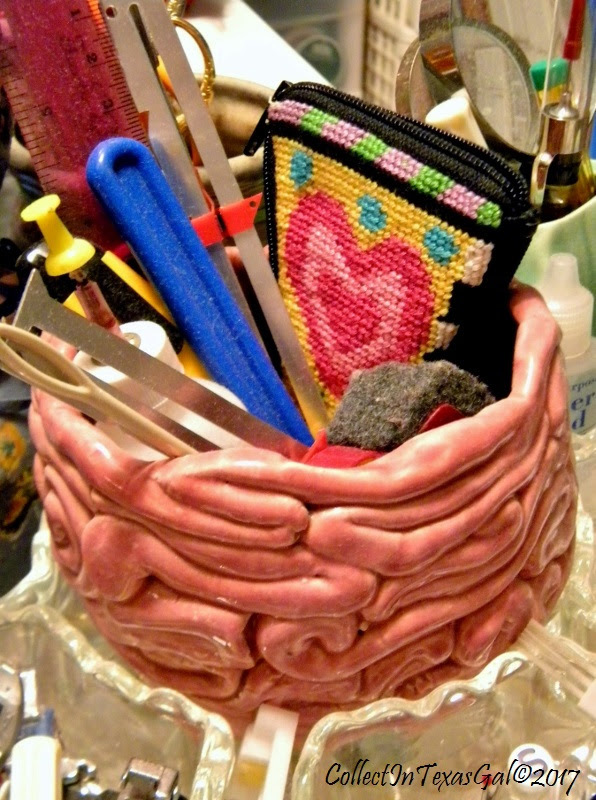 Like many things made over the years, 'Brainiac' found it's way to my Studio as a sewing tool catch all. I hardly notice or think about it's likeness to a brain anymore...until it turns up in a photo shoot of all the bric-a-brac containers that hold a slew of more bric-a-brac. 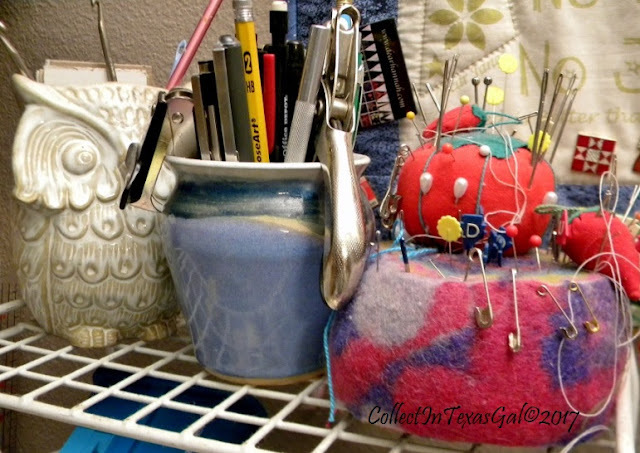 I am sure you know as a collector/user of sewing/quilting/knitting/crocheting/crafting tools and supplies...how important it is that those tools be handy, organized and visually present. After all, how can they be of use if they are hidden away and forgotten in a drawer. Not that I don't have a drawer or two of tools less used or ready for backup. It's one thing to have collection of curios curious bric-a-brac tool holders, but yet another to make containers/holders for the bric-a-brac tool holders. That is exactly what I find myself doing with rag baskets. and are visually present and pleasing. They are 'No Brainer-Brainiacs' ! Maybe we can thank (or blame!) that Brainiac tool caddy for your ever-sharp, ever-clever, ever-brainy descriptions and musings. A++ on the rag baskets. bric-a-brac for the bric-a-brac...when does the madness stop? 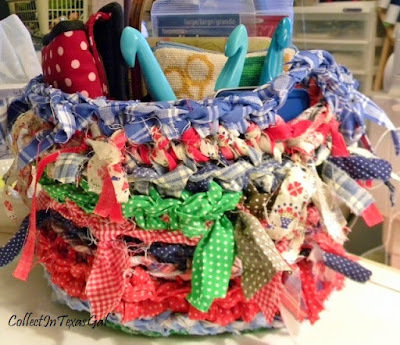 I have one rag basket, that I love. I also have some 'thumb' pots my son's made in school. Hey, I did get to your booth at American/British Antiques. My BFF loved the pink and white vintage tablecloth. I was tempted by the bags of scraps, but, I really need to start using my own scraps before I start buying other peoples scraps. I did find a cute Singer 20 Sew Handy toy machine that I'm coming home with. Definitely gotta keep the tools handy! 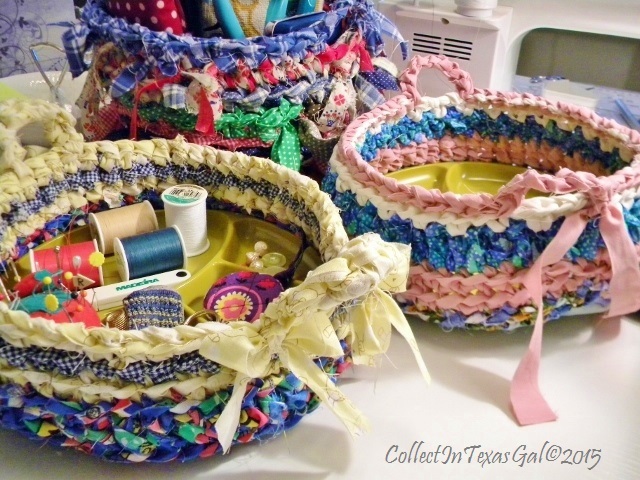 Love the rag baskets.